Super soft and semi-stretch micromodal fabric cropped top with triangular side slits. 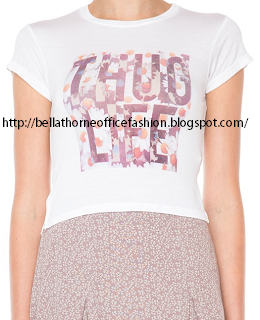 A crewneck top with thug life graphic print. Thick strap top with double strap back detailing. You could wear this as a top or a bralette, just make sure to style it with your favorite bottoms! Babydoll dress in lightweight chiffon with v-neck, adjustable straps, and a raw-edged double layer ruffled hem. This adorable dress is a Brandy favorite! Pair it with one of our cute strappy bralettes to show off the low back.